Competitive advantage. The value chain. Five forces. Industry structure. Differentiation. Relative cost. 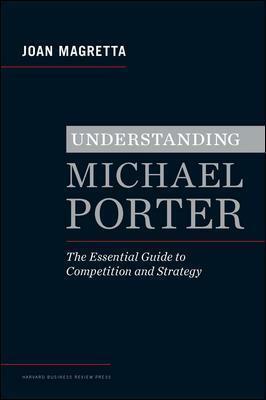 If you want to understand how companies achieve and sustain competitive success, Michael Porter's frameworks are the foundation. But while everyone in business may know Porter's name, many managers misunderstand and misuse his concepts. Understanding Michael Porter sets the record straight, providing the first concise, accessible summary of Porter's revolutionary thinking. Written with Porter's full cooperation by Joan Magretta, his former editor at Harvard Business Review, this new book delivers fresh, clear examples to illustrate and update Porter's ideas. Magretta uses her wide business experience to translate Porter's powerful insights into practice and to correct the most common misconceptions about them--for instance, that competition is about being unique, not being the best; that it is a contest over profits, not a battle between rivals; that strategy is about choosing to make some customers unhappy, not being all things to all customers. An added feature is an original Q&A with Porter himself, which includes answers to managers' FAQs. Joan Magretta has worked with Michael Porter for almost two decades; she is a Senior Associate at the Institute for Strategy and Competitiveness at Harvard Business School, a McKinsey Award winner, and author of What Management Is, a top pick of its year by The Economist. She was a Bain partner and strategy editor of the Harvard Business Review.